All the volunteers gave many kisses and treats to Lorccan in the days before JoAnn waved goodbye to our Old Friend on May 7th as his van left us for a new career in Kentucky at New Vocations. We'll all miss him very much but we know he'll be happy and will make some new, special friends there. Lorccan, who is 12 now, never seemed to settle into retirement. We wish him much happiness in his new career. 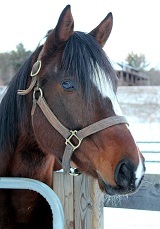 Born Feb. 1, 2004, By Aptitude, out of Designer Phone, by Phone Trick Lorccan is a beautiful gelding. He raced 36 times and was in the money 15 times (7-3-5). He raced from 2006-2008, and 2010. He won 2 stakes races as a 4 year old. These races are the Coyote Lakes Stakes at Aqueduct, and The Salute Me Sir Stakes at Belmont. He also raced in the Gallant Fox Handicap at Aqueduct and the Empire Classic at Belmont. Lorccan missed his entire 5th year of racing due to bone spurs in his leg. He raced in an Allowance race as a 6 year old, and then was retired due to more complications with bones spurs. He arrived at Cabin Creek on 9/1/10. In all, Lorccan earned $278,481. Lorccan was bred by Sorin Stables, owned by Lianna Stables, and trained by James Ferarro. He is NY bred.